Students groups rotate between Learning Stations for 8-10-minute presentations from Industry Champions- young skilled trade professional with years of practical experience in each industry. Learning Stations highlight different aspects & opportunities of a skilled trade career and insights on how to prepare for the first job. Attendees walk away with one-pagers from each Learning Station to include descriptions of job duties, potential salary, required education, training & certifications and contacts for further information. Twenty million baby boomers will retire in the next five years. Of the 15 million high school students in the United States, over 5 million have no post-secondary education plans. At the same time, the country is experiencing a critical skills gap in filling entry level positions. As you know, companies are losing money on business they can’t complete and struggling to find employees to maintain the business they already have contracted. Collaboration is necessary to bring the next generation into the skilled trade industries. Over 70% of America’s businesses have little to no relationship with the greatest source of future employees, high schools. 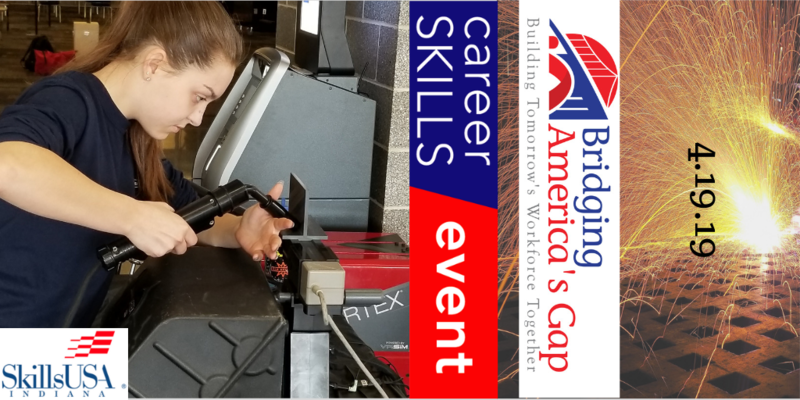 Bridging America’s Gap Career Skills Event, hosted by SkillsUSA Indiana, will bring students and educators together with industries and businesses who are looking to build an entry level employee pipeline. Together, we can expand the U.S. workforce, improve productivity and increase profits while leading the next generation to good paying careers. Click here to learn more about SkillsUSA Indiana State Conference. © 2018 Bridging America’s Gap. All Right Reserved.